Craig Gillespie, director of the Oscar-winning I, Tonya, is in negotiations to direct Cruella for Disney. The Mouse House has been developing quite a few live-action movies based on their animated classics in recent years and, in this case, they intend to focus on the villainous Cruella de Vil, who we were first introduced to in 101 Dalmatians back in 1961. This time around, they've tapped Emma Stone to star in the origin story, which has been in development for several years. But the project may have new life. According to a new report, Craig Gillespie is in early negotiations to helm Cruella for Disney. He hasn't signed on the dotted line just yet, but this feels like a very good fit. Gillespie not only helmed a recent critical darling in I, Tonya, the Tonya Harding biopic that earned Margot Robbie a Best Actress Oscar nomination and Allison Janney a Best Supporting Actress win. He's also worked with Disney in the past, having directed real-life rescue mission drama The Finest Hours and the real-life baseball drama Million Dollar Arm. Pairing him with a bankable, Oscar-winning actress who can sing, dance and act in Emma Stone seems like a solid coupling. Previously, Mozart in the Jungle creator Alex Timbers had been attached to direct Cruella. However, his work on Broadway, which consists of Beetlejuice and Moulin Rouge next year, got in the way of him being able to fit this in. So, Disney began searching for a new director and Craig Gillespie wound up becoming their man. As for what to expect? The origin story is said to be taking place in the 1980s and will have a "punk" vibe to it. What that means exactly remains to be seen, but Emma Stone as a fashionable punk villain seems like it would produce a great poster, if nothing else. Related: Emma Stone to Become Disney's Cruella de Vil? 101 Dalmatians was a big hit for Disney in 1961 that was later brought to live-action in 1996, with Glenn Close starring as Cruella de Vil. Close would go on to reprise the role in the sequel, 102 Dalmatians, in 2000. The first live-action movie was quite successful, bringing in $320.6 million worldwide. The sequel was less successful, bringing in $183 million. But more importantly, the story has already been told in that way. Hence, why we're getting an origin story about the villain, as opposed to a modern live-action retelling of the animated classic, which Disney did with Beauty and the Beast last year to great success. There's no word on when Cruella could begin production. Emma Stone is gearing up to shoot Zombieland 2 in January. For the time being, it doesn't seem like Craig Gillespie has any major projects that would get in the way of him making this a priority, should he sign on the dotted line. Next year, Disney has three live-action remakes on the way, with Tim Burton's Dumbo arriving in March, Guy Ritchie's Aladdin set to follow in May and Jon Favreau's The Lion King capping things off in July. Cruella does not currently have a release date. This news was previously reported by The Hollywood Reporter. 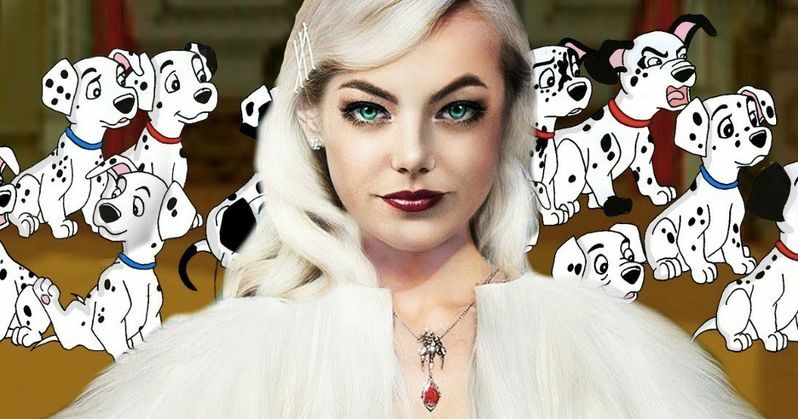 Emma Stone to Shoot Disney's Cruella Movie This Summer? Emma Stone's Cruella de Vil Movie Taking Place in 1970s England?